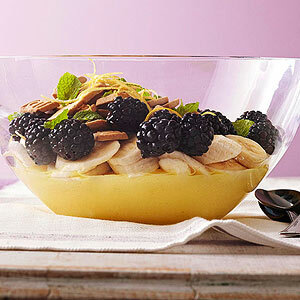 There's a reason this is called a trifle--it's a breeze to put together! Instant vanilla pudding and pie filling mix and packaged shortbread cookies speed dessert prep. Prepare pudding mix according to package directions, stirring in lemon peel with milk. Transfer pudding to a serving bowl or dish. Top with sliced bananas, berries, and shortbread cookies. Garnish with lemon zest and fresh mint. *Tip: If using vanilla pudding, stir 1/4 teaspoon finely shredded lemon peel into each of the containers of pudding.